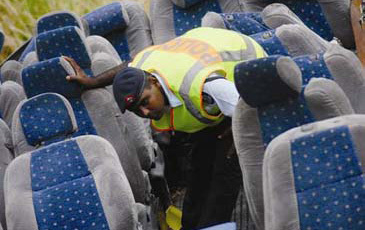 Police officer Ashwin Kumar at the site of the bus crash in Yavuna on Nov. 27, 2008. Two Korean nationals who survived the 110-metre plunge in the Nausori Highlands were fighting for their lives at the Lautoka Hospital on Nov. 27, 2008. Hospital assistant general manager Doctor Jemesa Tudravu said initially four Korean nationals and the driver of the bus were transferred from the Nadi Hospital to Lautoka. Dr. Tudravu said two of the tourists and the bus driver were treated and sent back to Nadi because they had minor injuries. He said a Korean male, aged 33, had severe chest injuries and had to be admitted to the Intensive Care Unit. "The victim is in a serious but stable condition," he said. "Another victim that was brought in and is also admitted in the ICU is a Korean woman, aged 33 as well. "The woman has pelvic fractures and spinal injuries." National Blood Bank manager Seru Rokosuka yesterday warned road users to be careful this festive season.He said road accidents and injuries usually increased toward the end of the year. "I am speaking and saying this because of past experience. This is the time of the year when we need blood the most," he said.